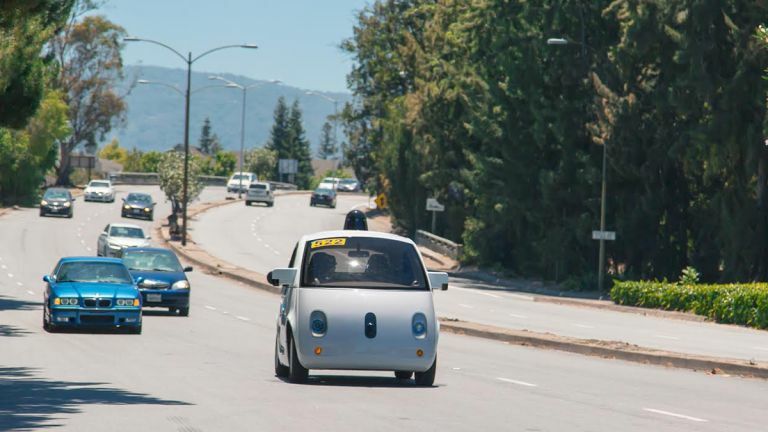 Google's adapted self-driving cars have already been cruising the streets of California for several years, but now the tech giant's dedicated autonomous buggies are mingling with traffic for the first time in the Golden State. These cars have been built by Google from scratch to test the future of transport out in the real world. "The arrival of our new self-driving vehicle prototypes marks the start of a new phase of our project," says Google. "We want to understand what it really means to have self-driving vehicles in the world - both how people in the community perceive and interact with them, and what the practical realities are for us in operating and maintaining them." The new cars are limited to a top speed of 25mph and all have a human driver on board. They're fitted with a removable steering wheel and accelerator and brake pedals, though ultimately Google says it wants to do away with all these traditional driving controls to make the vehicles fully autonomous. That won't be for some time yet, and in the meantime the company is inviting feedback on the next phase of its self-driving car adventure. If you spot a Google vehicle causing or avoiding chaos on the roads there's a feedback form you can fill in. Google has also started delivering monthly reports detailing the performance of its cars as well as any accidents they're involved in.